One of the problems (yeah, we should all have such problems) with all the great bread I’ve been getting, is keeping it in peak condition. Since there are only two of us preserving it becomes a challenge. Usually, my go-to is to slice it all up and put it in the freezer, so I can grab as many or as few slices as I need. That works fine as long as there is room in the freezer and you remember to pull it out in time. A while ago, I bought the Bee’s Wrap for baguettes and it’s worked pretty well on a number of different breads. More recently, I found out that Freshpaper a product to keep veggies fresh that I’ve liked from the beginning, was coming out with a Freshpaper for bread, so I ordered some. It’s a small sheet that’s permeated with organic spices that you toss in your produce drawer and it keeps produce fresh longer. It’s always seemed to work with produce (would probably work better if I changed them more often), so I wanted to try it with bread. The whole idea for a comparison came from a conversation with Cynthia of Pawling Bread Company. I had shown her the Freshpaper for bread and we started talking about that versus Bee’s Wrap. Since I had both, it was time for a showdown. 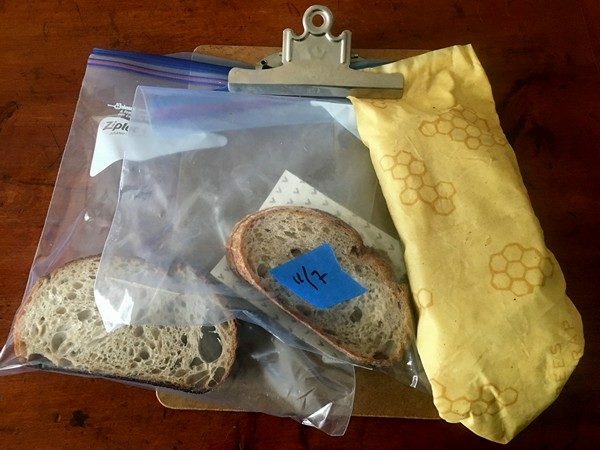 I took a regular Ziploc bag, a Ziploc with the Freshpaper and the Bee’s Wrap and put 2 slices of Cynthia’s previously frozen country bread in each, left them on the dining room table and waited. The first to go was the Bee’s Wrap. While the bread remained soft, it started to show the slightest hint of mold after day 5. Next to go, again with just the slightest hint of mold, was the regular Ziploc, on day 6. The winner was the Ziploc with the sheet of Freshpaper in it, which went a week without the bread spoiling and only had the tiniest spot of mold on it. IMHO, it was essentially a tie. 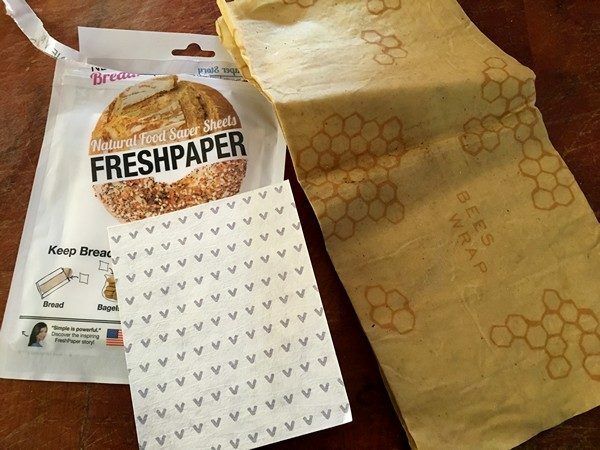 Would I spend the money on either the Freshpaper or Bee’s Wrap after doing the test? No. Would it be different in the summer (more humidity) or with different bread or baked goods? Maybe. After I wrote this, Cynthia was wondering if the freshness of the bread had anything to do with how long it lasted, since the first loaf I tested had been frozen. She kindly offered up a fresh loaf to taste and I accepted the challenge. This time the results were a little different. All three were still soft after 5 days. However, the two in the Ziplocs were moldy after 5 days. The one in the Bee’s Wrap was still fine. 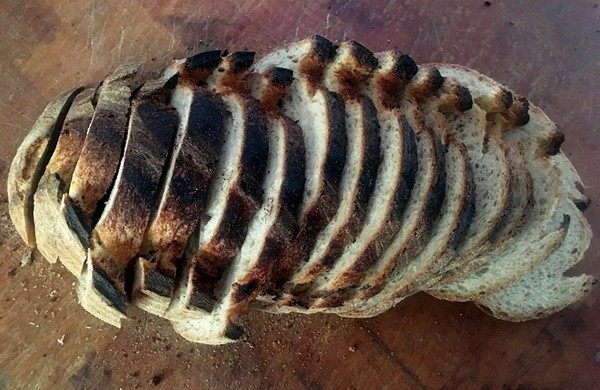 The next morning, I went to toast the slices in the Bee’s Wrap and those slices had started to show some mold. It wasn’t as bad as the ones in the Ziplocs but it was much more widespread than the first batch. Now, I’m even more convinced that for this kind of bread, any kind of plastic bag would work fine. It was interesting that the slices from the freshly baked bread didn’t last as long as the previously frozen ones. Maybe it was moisture from the bread or maybe freezing it killed off the mold spores. What do you think? What’s your favorite way to keep bread fresh? Accidental Update: Bought a loaf of raisin bread from Cynthia, sliced it and put it in a Ziploc. Lasted over a week. Could have been that it never got above freezing the whole week. Who knows? OXO: Could Mini Lock Tops Replace Ziplocs? OXO has a great blogger outreach program, and, as part of it, a couple of weeks ago the Accidental Locavore got a nice, big, white box in the mail from them. It was originally supposed to be a mandolin, but somewhere it turned into a set of lock-top storage containers (disclosure notice: these were sent to me by OXO for free). Initially, not getting a second mandolin was disappointing (the very good one I have was the first gift my husband gave me—pretty cool, right? ), but as time has elapsed and I’ve had a chance to use these containers, the Locavore has grown fiercely protective of them. OXO sent two sets, each consisting of a large square container, two small square ones and two tiny squares. At first glance, the little minis seemed essentially useless, but boy was I wrong! 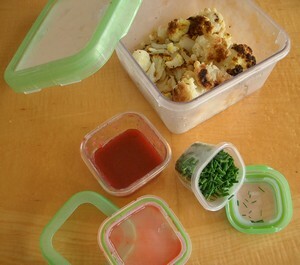 These have become my go-to containers, holding fresh snipped chives from the garden, a leaky packet of piment d’espelette, a small amount of vinaigrette for the smoked trout salad and anything else I might usually toss into a Ziploc bag, like lemon slices for iced tea. Besides being extremely useful (and BPA free), they manage to assuage my guilt for ruining the environment by overusing plastic bags. Even the larger one manages to be useful in an unexpected way. After years of translucent storage containers (no glass containers in the city, no place to store them), with opaque tops, it’s amazing how much guessing it takes out when you can see clearly on all sides! The tops are in two pieces, which might be a little over-designed, however nothing leaked when I was enthusiastically shaking the salad dressing to emulsify it. Even though the lids seal tightly, they pop on and off pretty easily, a good thing for sometimes wet or slippery hands! So, if they sound good to you, you’re going to have to buy them for yourself (and try the little guys, you’ll be amazed at how often you reach for them). 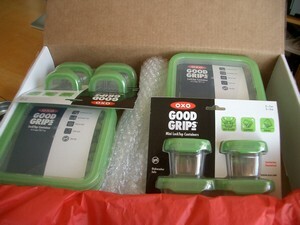 OXO sent me two sets and I was supposed to send one to a reader as a give-away (does the one I gave to Zhu Zhu count? ), however, as per usual, I didn’t read the directions and one set is in use in each house…oops! Comment and let me know what great uses you find for them, especially the little ones!